In Waldorf homeschooling the main academic subjects are presented one at a time in blocks. A main lesson block typically lasts 2 - 4 weeks and the main lesson takes 1 - 2 hours a day. It’s a holistic approach to learning so even though one subject is the focus in main lesson, each day the subject is taken up in many different ways. In a math main lesson, for example, there is time for movement, hands-on problem solving, mental math, written work, and illustrating a beautiful main lesson book. There might also be poetry, stories, painting, games, modeling, origami, string games, or form drawing. The main lesson involves balanced work with head, heart, and hands. Taking the time to really focus on one subject at a time is one of my favorite parts of Waldorf homeschooling! It gives you a chance to revel in the beauty of a subject. There is plenty of time to teach through art and storytelling and to work towards truly understanding and remembering what is learned. There are certain subjects which are recommended for each grade level based on the development of the child at that age. Of particular importance in Waldorf is the story curriculum because the story themes are a mirror of the child’s stage of development. In first grade the focus is on fairy tales (with plenty of room to add in nature stories and folktales as well). A typical first grade year includes main lesson blocks on form drawing, fairy tales, math, and nature. There is a lot of flexibility in how and when to present each topic. You as the teacher can decide what your child needs, how to structure the day, the week, and the year to accommodate your whole family, and how you want to bring your own creativity into your lessons. It helps to have some guidelines, though, so here are a few things to keep in mind. Form drawing is usually the first main lesson block of the year and then continues to be a weekly subject throughout first grade. Use your form drawing block to establish the rhythms of your school year. You can tell a fairy tale each week or let your forms be inspired by nature stories. Begin the first day of first grade with the straight line and the curve, the simplest of forms which are the basis of all the others, and then build in complexity over time. Actually drawing the form is usually only the last and shortest part of the lesson. Take time first to experience the form with your whole body and through movement. You can walk forms or move them in other ways (crawl, skip, tiptoe, etc.). You can trace them in the air, on each other’s backs, in a sand tray or sand box, or in the mud using a stick. You can shape them from a long rope, with bread dough, or beeswax. Different forms will lend themselves to different imaginations and movements. Two weeks is generally a good amount of time for a form drawing block. You can add in more form drawing blocks later in the year if you like. There are typically around four language arts blocks during the year, interspersed with the math and nature lessons. In the first language arts blocks you discover the alphabet. The letters come from pictures that you draw from the fairy tales. Later in the year you can make readers with summaries and illustrations from the fairy tales. The fairy tales can also be the inspiration for your painting and form drawing lessons. Most homeschoolers do three math blocks in the first year. The first one is focused on the quality of numbers. Math is not an abstract human invention - it’s a natural language which is expressed in form, sound, rhythm, and nature all around us. So you can start with experiencing numbers before you learn to do arithmetic. What does a rhythm of threes feel like in the body? What always comes in threes? The next two math blocks introduce the four processes (addition, subtraction, multiplication, and division). All four processes are taught together. You can use stories to introduce math concepts but math is also learned through hands-on problem solving, rhythmic movement, games, and lots of practice. Math practice can happen regularly outside of main lessons, too, especially with circle time activities. In Waldorf schools, teachers often present main lessons with nature stories. At home, I think you can make nature a big part of your family life and you don’t necessarily need to do nature main lessons. Just as in kindergarten, actually spending lots of time in nature is the best education. It’s wonderful to have a nature table, a garden, and places that you visit regularly in all seasons. You can tell simple nature stories about the plants and animals in your area. You could also make this a main lesson by creating a reader with nature stories or poems, along with painting, modeling, and crafts. Some homeschoolers create nature blocks around a theme such as the four seasons or the four elements (water, earth, air, and fire). The other first grade subjects (crayon drawing, painting, modeling, foreign language, handwork, recorder, and in schools, eurythmy) are usually taught as mid-day or afternoon lessons and/or incorporated into main lesson time. You could bring them as blocks, though, if you like. For example, you could introduce knitting in the autumn with a one-week handwork block or you could take two weeks in the winter to introduce recorder lessons. Another possibility is to make an original main lesson around something that really speaks to you or your child. You can accomplish a great deal in the first grade year with just an hour or so of main lesson three or four mornings a week, so long as most of your child’s day is filled with healthy activity such as playing, helping at home, moving his body, and being outside. I think many homeschoolers would agree! 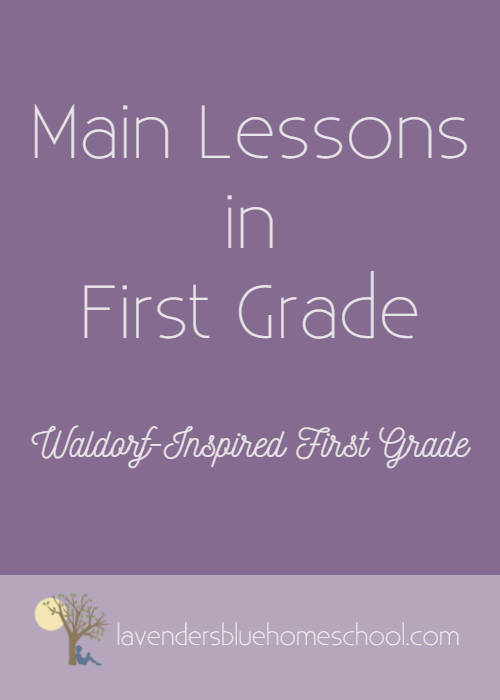 The Lavender's Blue Homeschool First Grade curriculum is a complete Waldorf-inspired curriculum that includes all the main lessons you need for a year of first grade at home! Need help with First Grade planning?